tilevel tabu search against its single level v ariant are presented. algorithms based on branch and bound techniques . to their conceptual simplicity and good performance. bourhood on prob lem instances with up to 150 variables. 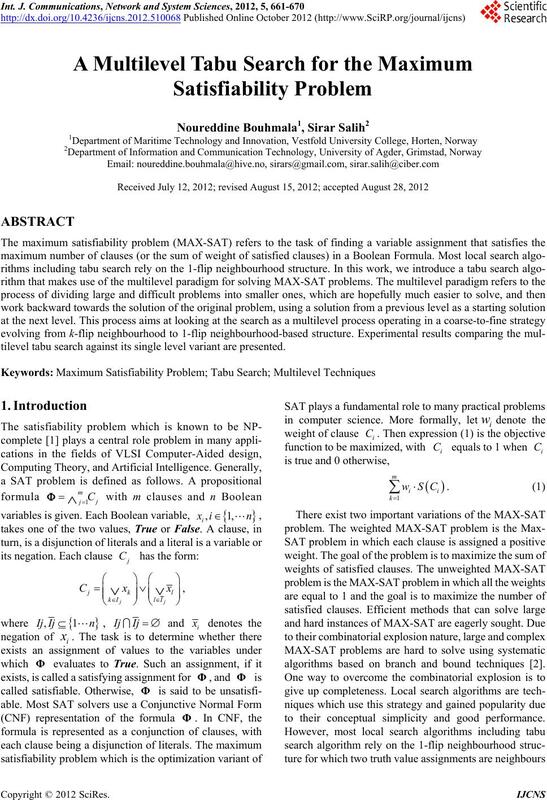 ficient algorithms for solving large MAX-SAT problems. intuition, because very little theory is available as a guide. tive Search Procedures  have also been proposed. shown their effectiveness for a wide range of problems. Tabu Searc h algorithm (TS) was pr oposed by Glover  . 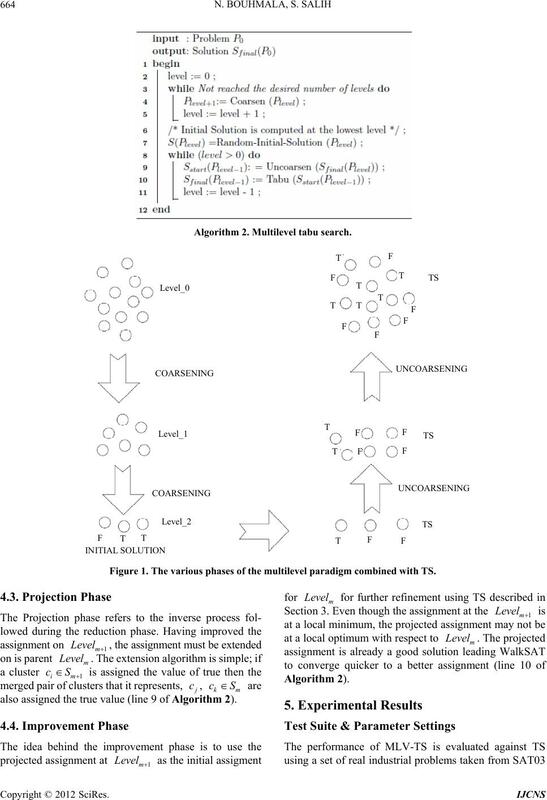 gorithm used in this work is described in Algorithm 1.
value 0, its corresponding literal becomes non tabu. is computed using a randomized algorithm similar to . TS rea- ches the stop criteria that is met at . 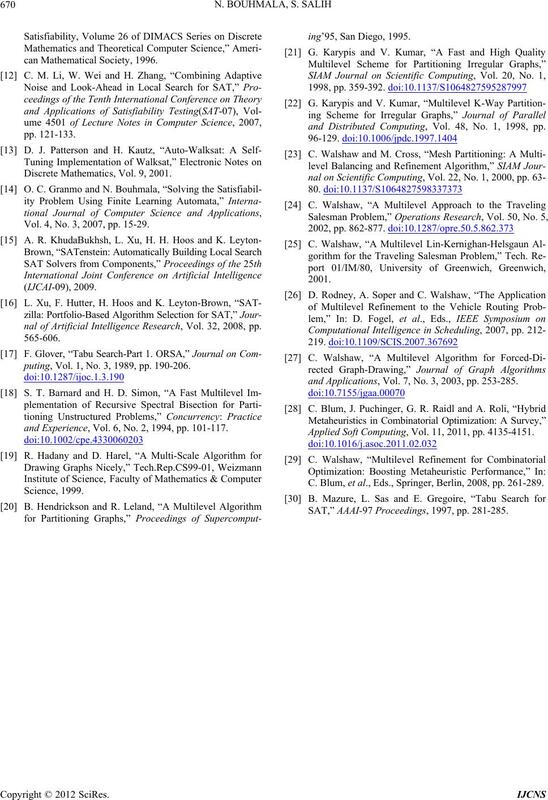 limited number of combinatorial optimization problems. 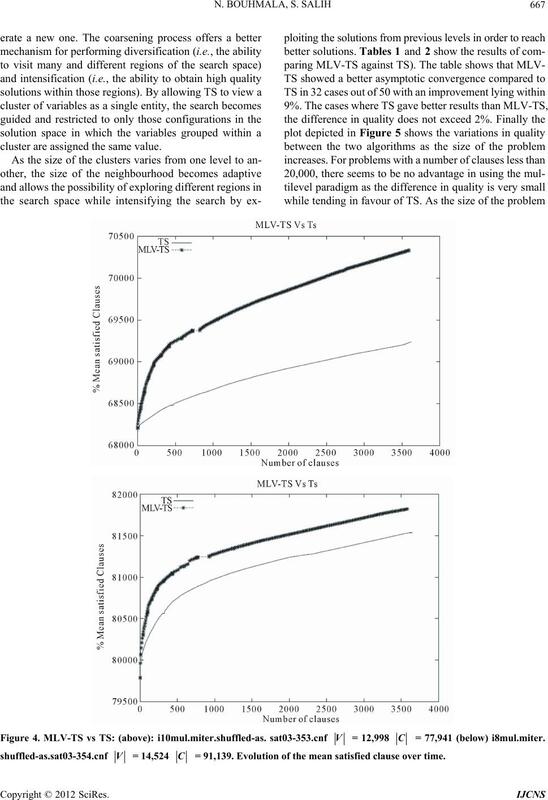 convergence behavior of the local search algorithms. algorithm operating in a multilev el context. Algorithm 2. 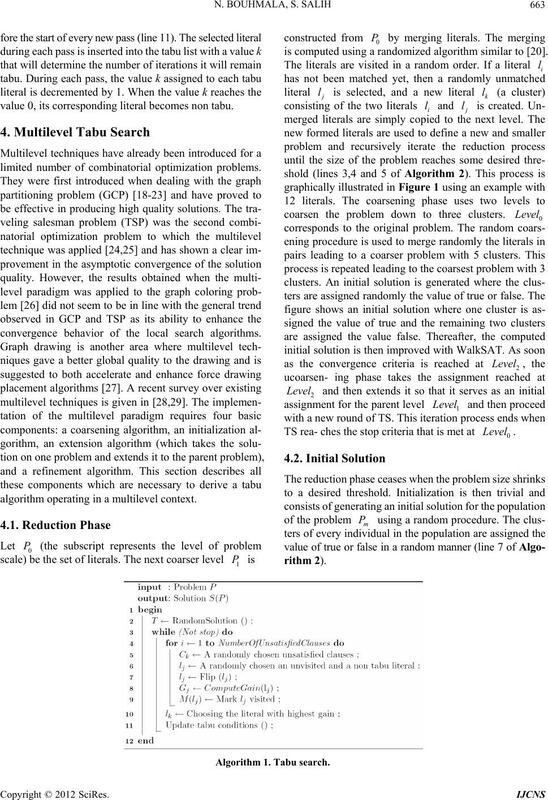 Multilevel tabu search. Figure 1. The various phases of the multilevel paradigm combined with TS. also assigned the true value (line 9 of Algorithm 2). 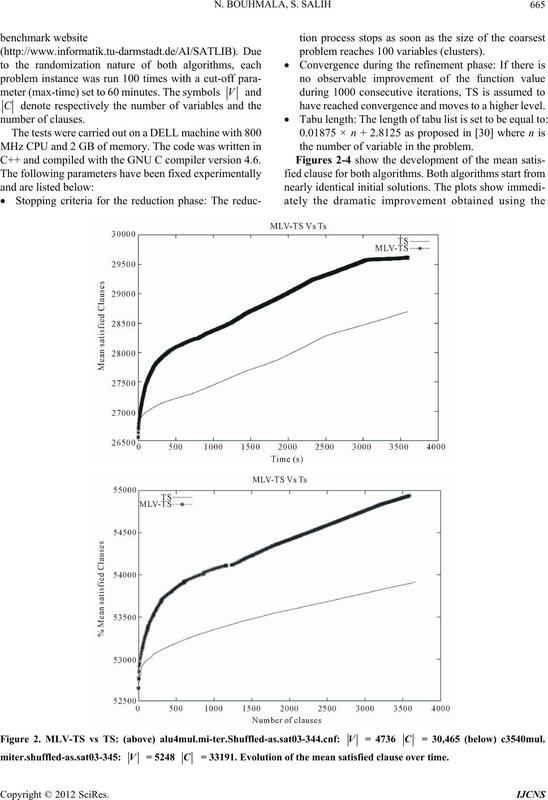 C++ and compiled with the GNU C compiler version 4.6.
problem reaches 100 variables (clusters). have reac hed conve rgence and m oves to a higher le vel. the number of variable in the problem. Figure 2. MLV-TS vs TS: (above) alu4mul.mi-ter.Shuffled-as.sat03-344.cnf: V = 4736 C = 30,465 (below) c3540mul. miter.shuffled-as.sat03-345: V = 5248 C = 33191. Evolution of the mean satisfied clause over time. Figure 3. MLV-TS vs TS: (above) 6288mul.miter. shuffled-as.sat03-346.cnf: V = 9540 C = 61421 (below) dalumul.miter. shuffled-as.sat03-349.cnf: V = 9426 C = 59,991. Evolution of the mean satisfied clause over time. ciency of MLV-TS relies on the multilevel paradigm. cluster are assigned the same value. Figure 4. MLV-TS vs TS: (above): i10mul.miter.shuffled-as. sat03-353.cnf V = 12,998 C = 77,941 (below) i8mul.miter. shuffled-as.sat03-354.cnf V = 14,524 C = 91,139. Evolution of the mean satisfied clause over time. Table 1. 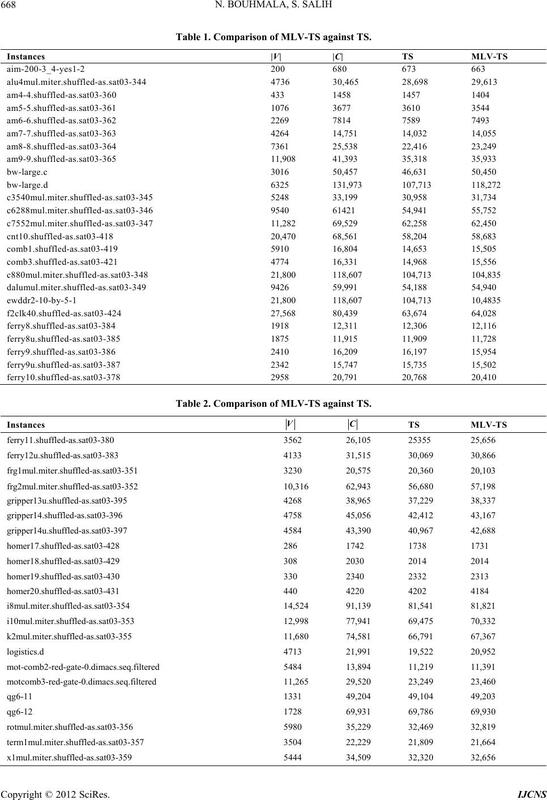 Comparison of MLV-TS against TS. Table 2. 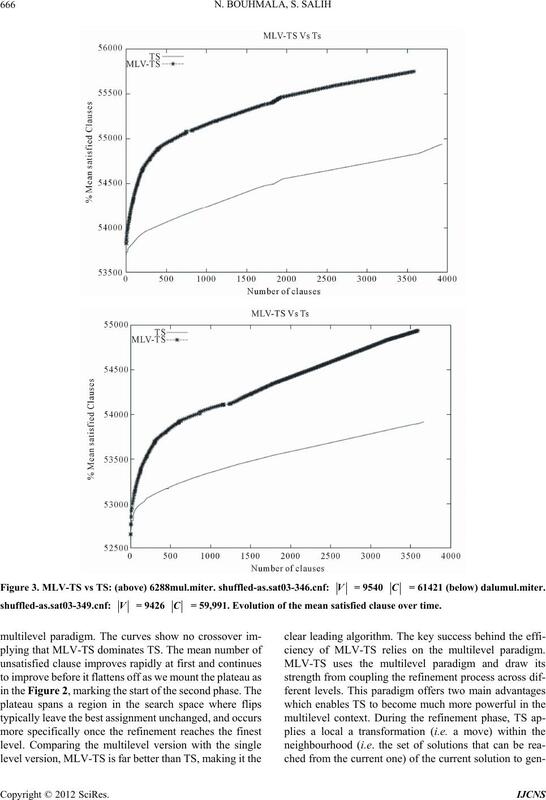 Comparison of MLV-TS against TS. sidered the right tool to us e for solve larger problems. quality becomes apparent as size of the problem increases. Theory of Computing, Shaker Heights, 3-5 May 1971, pp. 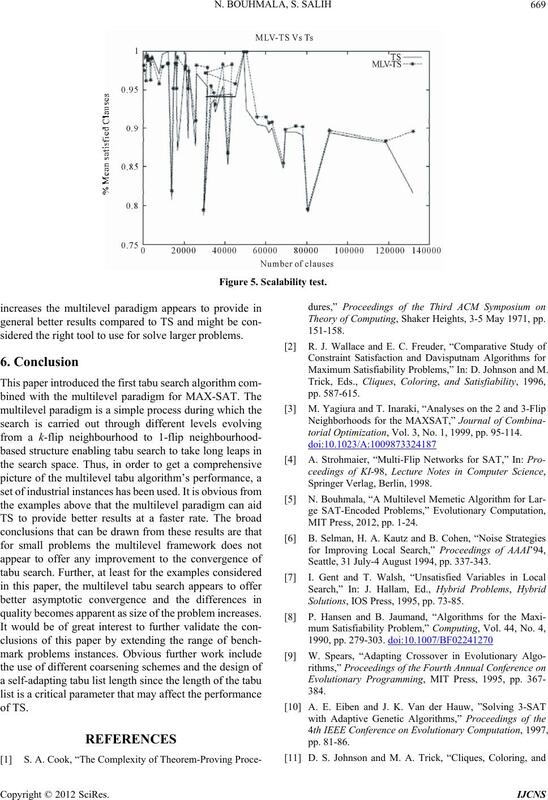 Maximum Satisfiability Problems,” In: D. Johnson and M.
torial Optimization, Vol. 3, No. 1, 1999, pp. 95-114. MIT Press, 2012, pp. 1-24. Seattle, 31 July-4 August 1994, pp. 337-343. Solutions, IOS Press, 1995, pp. 73-85. Discrete Mathematics, Vol. 9, 2001. Vol. 4, No. 3, 2007, pp. 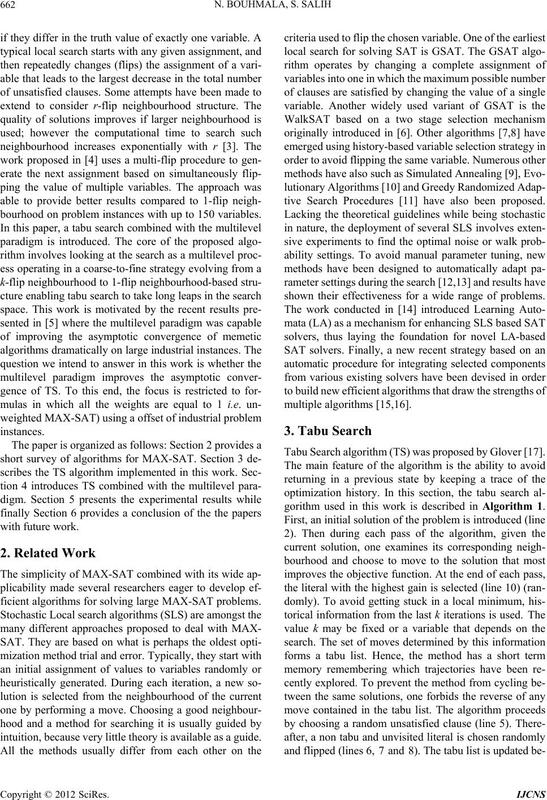 15-29.
nal of Artificial Intelligence Research, Vol. 32, 2008, pp. puting, Vol. 1, No. 3, 1989, pp. 190-206.
and Experience, Vol. 6, No. 2, 1994, pp. 101-117.
and Distributed Computing, Vol. 48, No. 1, 1998, pp. and Applications, Vol. 7, No. 3, 2003, pp. 253-285. Applied Soft Computing, Vol. 11, 2011, pp. 4135-4151. C. Blum, et al., Eds., Springer, Berlin, 2008, pp. 261-289. SAT,” AAAI-97 Proceedin g s, 1997, pp. 281-285.